How will you cope with Blue Monday? Apparently this is “officially” the most depressing day of the year. Of course it is and a Starbucks has just been found on Mars. Don’t fall for this nonsense. There’s nothing official about Blue Monday – it is PR tripe and bad science. Blue Monday simply does not exist and is a “scientifically ridiculous” stunt-day that we have bought into and has developed a life of its own. Blue Monday contributes to damaging misconceptions about depression and trivialises an illness that can be life threatening…There is no credible evidence to suggest that one day in particular can increase the risk of people feeling depressed. The Samaritans have decided to devote today as Brew Monday offering a brew and a chat at events across the country. Did you know that so-called Blue Monday was a day invented in 2005 by holiday company Sky Travel as part of its marketing campaign? Since then, Blue Monday has surfaced every year as some sort of factual entity we all have to be vigilant of and have strategies for coping with. Thankfully Blue Monday has little support and has been ridiculed and exposed for being just plain stupid. corrosive, meaningless, empty, bogus nonsense that serves only to caricature and undermine science. Gavin Oattes of Tree of Knowledge summarises this beautifully too in his video and talks about how there is “zero science” behind Blue Monday and why mental health charities are working to get Blue Monday banned. Why not instead put a positive spin on Monday? Gavin suggests lots of ideas including having a “Do Monday”, a “Baloo Monday” and even a “Gerard Depardieu Monday”. He thinks we should all embrace a Fondue Monday. so we can move away from the totally fabricated Blue Monday drivel. Called a ‘corporate whore’ by Ben Goldacre, Dr Arnall said he never intended to create an annual day of misery and now appears holding a new poster in order to stop it! The January Blues are a total fake and yet another example of bad science expelled from the backside of the PhD effect. 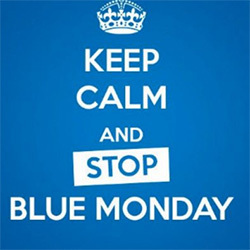 It’s time to STOP BLUE MONDAY. Blue Monday is ‘stupid’ wrapped in ‘absurd’ with a ribbon of ‘ridiculous’.